Please tell us a little about yourself. Where are you from? Where do you live now? Family? Pets? Hi and thanks for having me here! I’m originally from New Orleans, which I believe shaped who I became as a writer. I now reside in metro Atlanta, Georgia with my husband and very spoiled dog, a black lab mix. I have 3 grown step-kids, so the hubby and I enjoy our empty nest while we’re still able to see and get together with family since everyone lives in the metro Atlanta area. Where did you get the idea for NO GRITS NO GLORY and why did you choose this genre? The original nugget for the first book in my Southern Ghosts Series came from an offhand conversation. My sister-n-law’s mother owns a rental apartment in metro Atlanta, and at one time or another every family member has lived there. Aunts, uncles, cousins, nieces, etc. Some lived there for a few months; some lived for several years. When my niece mentioned she would be moving in there for a few months before she got married, I remember thinking, “What if those walls could talk? All those generations of family living there. What would the walls say?” and that became the start of NO GRITS NO GLORY. As far as picking the genre (romantic suspense/ghosts/paranormal), I think it really picked me! Growing up in New Orleans and being surrounded by Gothic architecture, Voodoo history and cemeteries definitely contributed to my wanting to write about otherworldly and paranormal things. Anything by Dennis Lehane or Cornelia Funke. Both of them have such vivid characters and settings, and they have a way with words that gives music to the story. Dennis Lehane’s Patrick McKenzie & Gennaro crime series and Cornelia Funke’s Inkheart series are two of my favorites. Sort of. I’m a technical writer by day, and a fiction writer by lunch hour, night and weekend. Basically, I take complex software and create user manuals that simplify how to use the software for a living. It’s dull, but it pays the bills! I also do speaking and teaching gigs, helping other writers learn to write their book, stay motivated, and then how to self-publish their books. I do enjoy this immensely and hope to eventually do more of this along with full-time fiction writing. My 9-5 job, no doubt. While I do have generous vacation, the traffic and time spent having to concentrate on tech stuff and then switch over to creativity is a difficult balance. Plus, just the general stress of corporate life doesn’t help the creativity. 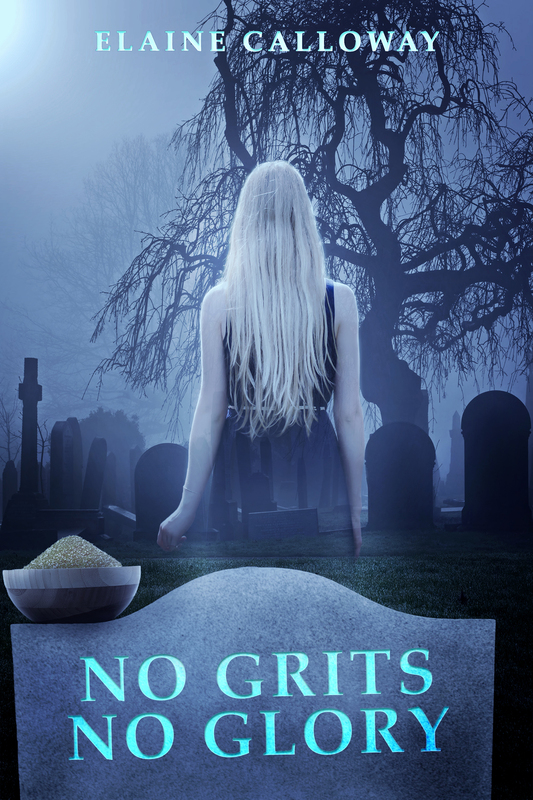 What do you want readers to come away with after they read NO GRITS NO GLORY? Hmm, good question. I suppose I want them to come away with an open mind to the possibilities of the paranormal. I’ve loved ghost stories as long as I can remember, but mine have mystery/humor/paranormal elements, not horror. I want readers to enjoy the book and learn more about my favorite place on Earth, Savannah, where the book is set. Ha ha! I actually have a Pinterest board for every book I write, so the photos can be found here: https://www.pinterest.com/elainecalloway/no-grits-no-glory-bk-1-southern-ghosts-series/. To sum up, Linda Fiorentino for Brianna, Eric McCormack or Tom Cruise as Steven, James McAvoy as Declan, and Ed Begley Jr. as Begley. For my writing process, I typically automatically pick either an actor or someone I know with the look/expressions I want for the characters. Then I add the photos to Pinterest and that keeps me inspired. I’m not a huge Tom Cruise fan, but Eric McCormack wasn’t my ideal pic either, so I kind of combined the two into my own visual to write the Steven character. I had the chance to meet John Lithgow when I was a teenager and worked at a movie theater that hosted a premiere of The Manhattan Project. He and several producers attended. We also held a premier for Spacecamp the same night, so I was able to meet Lea Thompson. It was a pun on the ole saying, ‘no guts, no glory’ but the book also has some Southern humor and scenes with grits (a popular breakfast item in the South) so the title seemed to fit perfectly. Movie – The Princess Bride, Secondhand Lions, Under the Tuscan Sun. Not sure I can ever narrow down favorite movies to just one! Which do you prefer: Board games/card games or television? – TV. I enjoy reading but also enjoy binge watching on Netflix. Thank you, Elaine I enjoyed getting to know you. We have some things in common. Dennis Lehane is one of my favorite authors. I LOVE his Patrick & Angie series. And Mystic River. I haven’t read the Inkheart series. I also try to make Pinterest boards for all my books, but I haven’t kept it caught up. I love doing it though. Check out Elaine’s books, aren’t the covers fantastic? They both sound like great reads! GIVEAWAY!! 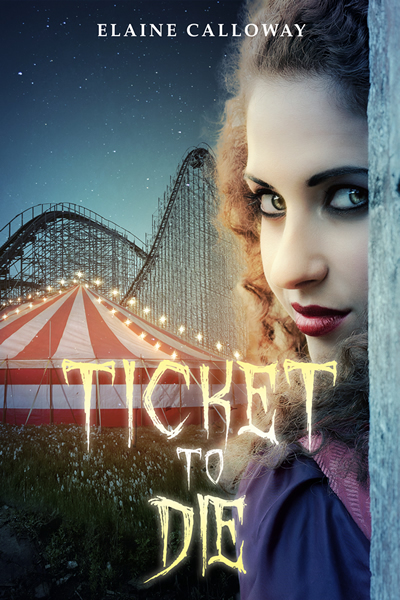 : READERS – Tell me your favorite ghost story or something that relates to a ghost story or ghost tour that you’ve taken for a chance to win the 2nd book in the Southern Ghosts Series, TICKET TO DIE. Elaine Calloway grew up in New Orleans with a love of all things paranormal. After recently completing a 5-book Urban Fantasy/Paranormal series, she is now focusing on more books in her Southern Ghosts Series. She also speaks at conferences and writing chapters about the craft, how to utilize time management and mental focus when writing a book, and how to self-publish books and market them online. She has a free Marketing for Authors course that is available here. For more info on her books, visit her author website at www.elainecalloway.com. For more info on her online courses and how to self publish, visit www.howtoselfpublishyournovel.com. Brianna fled to Savannah to escape the voices of the dead. Just when she thought she’d left all paranormal things behind, she discovers her house is haunted. Not just haunted, but haunted by Southern ghosts. These persistent beings not only hide her white shoes after Labor Day, but they leave grits-caked dishes in the sink, and swear to wreak havoc on her life – – unless she helps them. Steven put Savannah in his rearview mirror years ago to follow his passion for music. When his band splits up and he can’t reach his little sister for weeks, he races home—only to learn his whole family died in a mysterious house fire. The house Brianna now lives in. Together, Brianna and Steven must discover who murdered Steven’s family and become caught in a web of intrigue that will risk their careers, their homes–but especially their lives.